FEESST - How is it Performed? FEESSTÂ involves the passage of a thin, flexible fiberoptic telescope via the nose to the pharynx. Pooling, laryngeal penetration, aspiration and reflux of secretions can be visualized. Laryngopharyngeal sensation and airway protection are then assessed and a sensory discrimination threshold is determined. Air-pulse stimuli are delivered to the mucosa innervated by the superior laryngeal nerve to elicit the laryngeal adductor reflex (LAR). 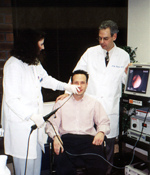 A comprehensive swallowing evaluation is then performed. The patient is given a variety of food consistencies containing green food dye to enhance visualization. Compensatory strategies/postures are attempted when indicated to facilitate improved swallowing function and reduce risk aspiration.